I was pleasantly surprised last night while watching the final “Millionaire” show. 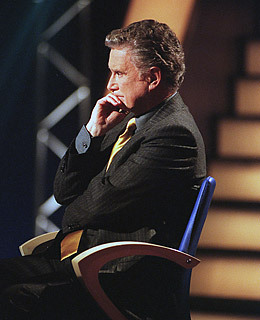 Regis asked the gentleman contestant,” who do you have in the audience with you tonight” and the contestant answered “my husband”. A smile immediately came to my face as I thought “good for you”. You just don’t hear that on T.V that often…unless you are watching a sitcom or the Ellen show. When he said those 2 words “my husband” it just seemed so natural for him that I was hoping all the “yes on Prop 8ers” would see that too. I know the Daily Dalia goes on and on about Prop 8 and I will continue to until all people in this country truly are considered “equal”. I don’t think I’m asking too much.